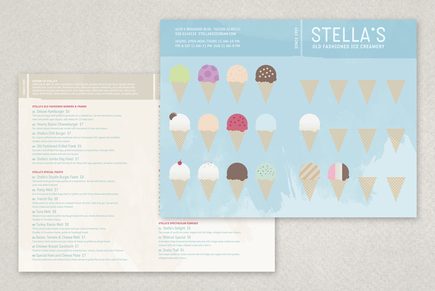 This teal, graphic menu is perfect for an old-fashioned ice creamery. The cheerful and illustrative graphic on the exterior of the menu captures the classic feeling of eating cold ice cream on a hot summer day. The interior can be used to elegantly display food and ice cream special.